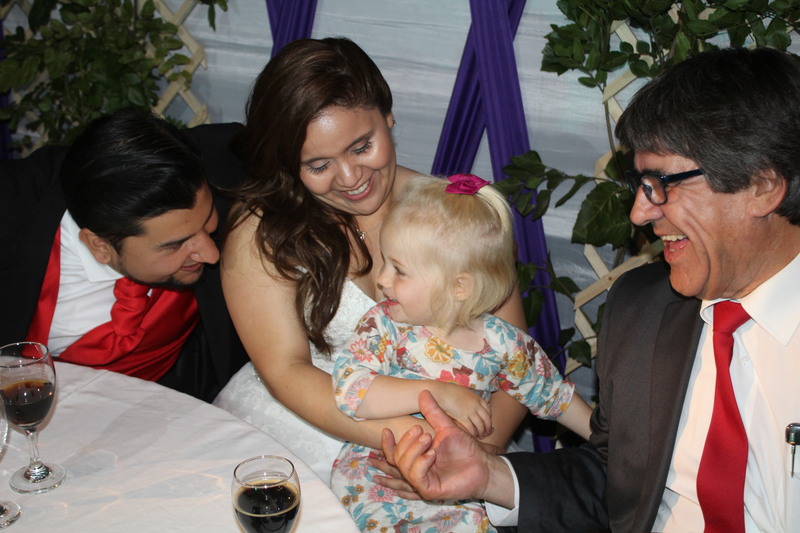 The reason for this trip to Chile was, in large part, so that our family might have the joy of sharing in the wedding that our Chilean “daughter”, Elizabeth ‘Mandy’ Arriagada Dölz was celebrating with her beloved, Matias Carrasco Mella. They further honored me by asking me to share in the preaching of this event. 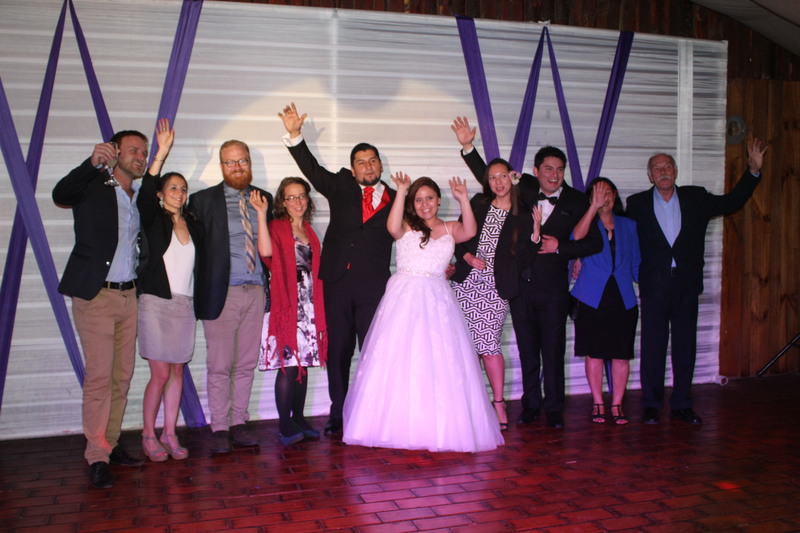 I thought that readers of this blog might enjoy the message preached in both English and Spanish, as well as a few photos of that event. 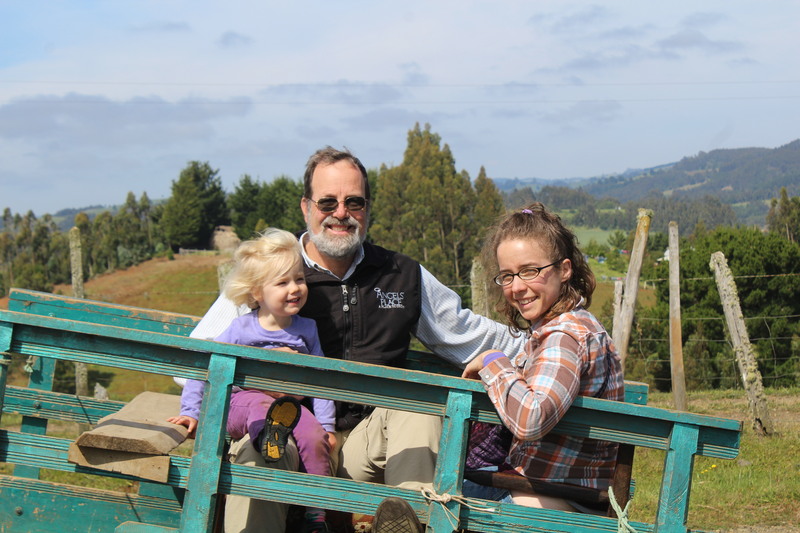 In 2010, our family had the opportunity to make our first visit to Chile. We were so excited to come to see Mandy’s family and community! There were tickets to be bought, clothes to pack, and activities to plan. One thing you should know about my family is that my wife is the “planner”. She makes lists, and usually, our daughter, Ariel, and I do them. So she made a packing list for our trip, and made us promise to bring everything on the list. One of the items on the list for this trip, which included not only Chile, but some of the rain forests of Peru, was a hat. 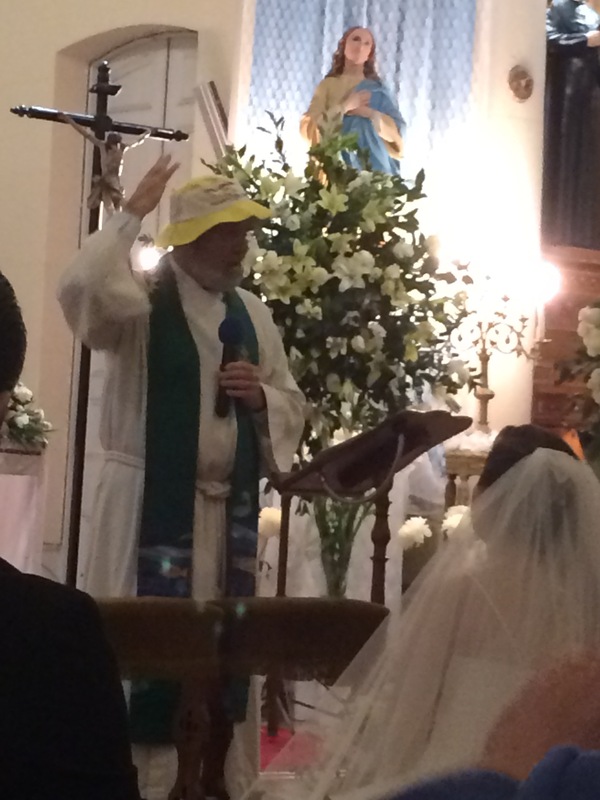 “Bring a hat that will keep the sun out of your eyes and the rain off your head,” she said. This is a classic hat. So I brought a hat. It’s a great hat. I love this hat. It was a gift from some friends in Africa. And, as you can see, it does the job. It will keep away the rain and the sun just fine. But she wouldn’t budge. She told Mandy to take me out and help me find a new, better, hat for our trip. Mandy took us to the market, and I saw all kinds of caps. So many different styles and shapes and sizes. This is a markedly better hat! And they said I should buy it, but I didn’t because of the cost. And Mandy looked at me and she said, “Listen, Dave: being Indiana Jones isn’t cheap, you know…” And Mandy bought me this hat. And I LOVE this hat. I wear it a lot. It’s been to Chile, Peru, Israel, Jordan, Egypt, Korea, New Zealand, Malawi, South Africa, South Sudan… It’s been all over the world. And when I wear it – even to cut my grass – I feel a little bit smarter, braver, and more creative. The hat helps me to feel, well, a little more like Indiana Jones. I’m telling you that story, not so much because I want you to know why I wear my hats, but because you know what it means to put on a piece of clothing and be changed a little bit. When you are getting ready to watch a big football match, you wear the jersey for your favorite team. Why? Because it helps you to cheer for them; it helps you to connect with them in some way. Similarly, when we get ready for church, we often put on special clothes. The priest or pastor wears a number of symbols to remind him and us that we’re in a different place, and many worshipers get dressed in their best clothes to worship. And look at today: Mandy is wearing a “wedding dress” – a special uniform that says a lot about who she is and who she hopes to be. Mandy and Matias will be wearing rings for the rest of their lives – little bits of gold or silver that don’t really DO anything… but they remind them, and us, and everyone else that they are people who make promises. When the Apostle Paul was writing to his friends in Colossae, he told them to pay attention to the things that they were wearing. In fact, he asked them to wear compassion, kindness, humility, gentleness, and patience – like an outfit. Put those things on as you walk around, he said, and sooner or later you’ll find that just like me wearing the hat makes me feel like Indiana Jones, wearing those things helps us to act like Jesus. At the end of the day, Paul said, “Put on love.” Make love your garment. Seek to do right by the people around you, and love them. That’s what we want you to do, Mandy and Matias. You’ve been together for a long time. You’ve known for a long time that this is what you’ve wanted – but for whatever reason, it’s taken you seven years (?) to do it. I know, Mandy, you thought I was taking a long time to pick out a hat back in 2010, but this is longer. A lot longer. So let me tell you: being married isn’t cheap. You may have been smart to give it so much thought and planning. Nobody should just jump into a decision like that. But now that you ARE married, let me encourage you to wear these things. Sometimes when we get something new we wear it for a little bit and then we come home and stuff it in the closet. Don’t do that with your promises and your hopes and your dreams. Put on love. Wear these promises. Wherever your marriage takes you, seek to act, every day, in grace and kindness and humility and gentleness and patience with each other. I’m here to tell you that you won’t always LIKE your spouse. And she or he won’t always be right. And she or he won’t always be wrong. Those are the times when you need to be especially careful to put on the love that you’ve had for so long. To wear it. 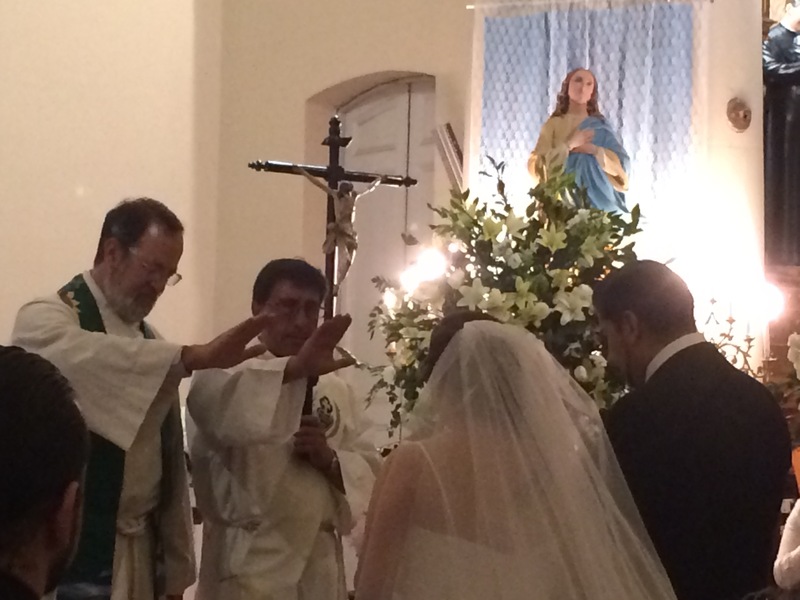 And to allow it to change your hearts so that you both continue to grow closer to each other and to the Lord. Put on love, my friends. It’s not cheap. But it’s worth it. All day, every day. Thanks be to God! Amen. 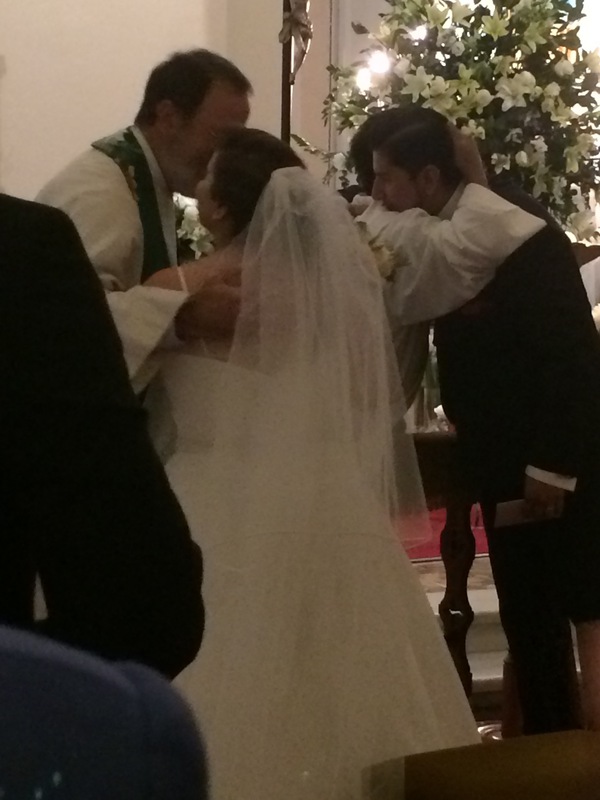 The Deacon invited me to share in the blessing of the couple. 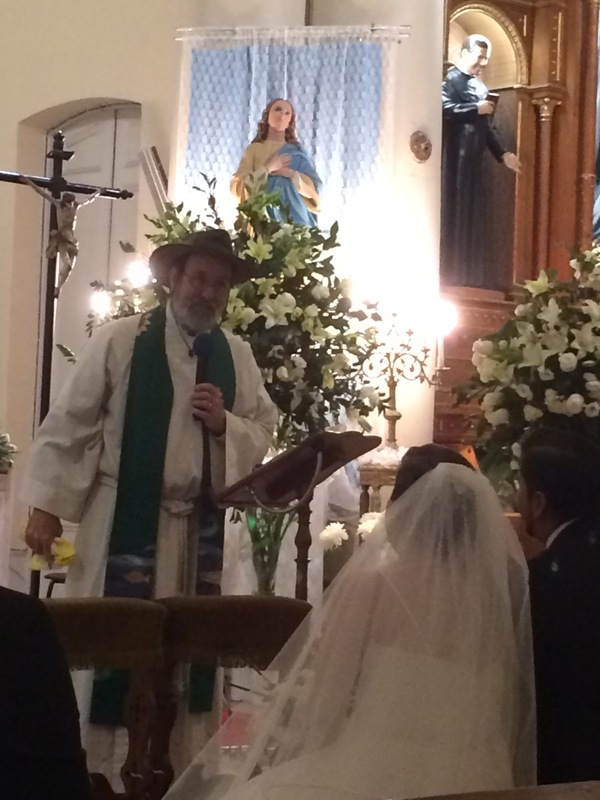 As the marriage was declared. En el año 2010, nuestra familia tuvo la oportunidad de realizar nuestra primera visita a Chile. Estábamos muy emocionado por conocer a la familia de Mandy y sus cercanos!. Pasajes que comprar , ropa que empacar y actividades a planificar. Algo que necesitan saber de mi familia es que mi esposa es la “planificadora”. Ella realiza una lista para nuestro viaje y nos hace prometer que llevaremos todo lo que dice la lista. Uno de los puntos de la lista para este viaje, que no solo incluye para Chile , sino que para las selvas tropicales de perú, fue un sombrero. “Lleva un sombrero que aleje al sol de tus ojos y la lluvia de tu cabeza”, dijo Sharon. Por lo tanto traje un sombrero: es un asombroso sombrero, amo este sombrero. Fue un regalo de algunos amigos de Africa y como uds. pueden ver, hace su trabajo. Me aleja de la lluvia y del sol muy bien. “No puedes usar eso! !, no es un buen sombrero!!!”.. Pero ella no se rendiría , Ella le dijo a Mandy que me llevara a encontrar uno nuevo y mejor para nuestro viaje. Mandy nos llevó al feria donde vi una gran variedad de gorros. Tantos estilos, formas y tamaños distintos. Entonces vi este sombrero y me encantó. Al mirar a mi hija y a Mandy, ellas dijeron: Oh, Dave, te pareces a Indiana Jones!!! Luego me dijeron que debería comprarlo, aunque no lo hice por el alto costo. Mandy me miró y exclamó: “Mira Dave, ser Indiana Jones no es barato, ya tú sabes…”, y ella me lo compró. Pues adoro este sombrero. Lo uso mucho. Ha estado en Chile, Perú, Israel, Jordania, Egipto, Corea, Nueva Zelanda, Malawi, Africa de Sur, Sudán… Estuvo alrededor de todo el mundo. Y cuando lo uso -incluso para cortar el pasto- me siento un poco más inteligente, valiente e ingenioso. El sombrero me ayuda a sentirme…bueno…un poco más como Indiana Jones. Les cuento esta anécdota, no para que sepan por qué llevo mi sombrero, sino para que sepan lo que significa colocarse una prenda de ropa y transformarse un poco. Por ejemplo, cuando están preparándose para ver un gran partido de fútbol, uds. usan la camiseta de su equipo favorito. ¿Por qué? Porque ayuda a alentarlos; los conecta con ellos de alguna manera. Igual que cuando nos preparamos para ir a la iglesia, generalmente nos colocamos una tenida especial. El cura o pastor lleva varios símbolos que nos recuerda que nos encontramos en un lugar distinto y muchos de los adoradores se arreglan con sus mejores tenidas para rendir culto. Y miren hoy: Mandy está usando un “vestido de novia” – un uniforme especial que dice mucho de quién es ella y quién espera ser. Mandy y Matías llevarán unos anillos por el resto de sus vidas – un poco de oro o de plata no hace mucho en realidad… Pero les recuerda, y a nosotros también, así como a todos que son personas comprometidas. Cuando el apóstol Paul, les escribió a sus amigos en Collossae, les dijo que pusieran atención en lo que estaban usando. De hecho, les pidió que llevaran compasión, amabilidad, humildad, gentileza y paciencia- como una prenda. Dijo: colóquense estos cosas como en cualquier ocasión, y tarde o temprano, encontrarán que – tal como yo con el sombrero me siento igual a Indiana Jones- al llevarlas puestas nos ayuda a actuar como Jesús. Al final del día, Paul dijo: vístanse de amor. Hagan del amor su prenda. Hagan lo correcto con las personas a su alrededor y ámenlos. Esto es lo que queremos que hagan, Mandy y Matías. Llevan mucho tiempo juntos. Han sabido por mucho tiempo que esto es lo que querían – pero cual sea la razón, les ha tomado siete año (?) hacerlo. Mandy, sé que pensaste que me demoré mucho rato para elegir un nuevo sombrero en el 2010, pero esto es mucho más. Entonces déjame decirte que estar casado no es barato. Seguramente has sido muy minuciosa en pensarlo y planificarlo. Nadie debería simplemente saltar en una decisión como ésta. Sin embargo, ahora que ESTÁS casada, déjame alentarte a llevar estas cosas. A veces cuando obtenemos algo nuevo lo usamos un rato y luego volvemos a casa y lo guardamos en el clóset. No hagas eso con tus compromisos, tus esperanzas y tus sueños. vístanse de amor. Usen estos compromisos. Donde sea que su matrimonio los lleve, actúen cada día, en gracia, con bondad, humildad, gentileza y paciencia el uno con el otro. Estoy aquí para contarles que no siempre te agradará tu esposo/a. Y ella o él no tendrá siempre la razón. Y ella o él no siempre estará equivocado. Esos son tiempos en los que deben tener cuidado en vestirse con el amor que han llevado por tanto tiempo. Llévenlo puesto. Y permítanle que cambie sus corazones para que ambos continúen creciendo para acercarse el uno al otro así como al Señor. Vístanse de amor, mis amigos. No es barato, Pero vale la pena. Todo el día, todos los días. Gracias a Dios. Amén. I am not the only one who thinks that’s a snappy hat! Instead of place cards at the tables, the crowd was called out to stand for a photo with the couple, then ushered to their seats. 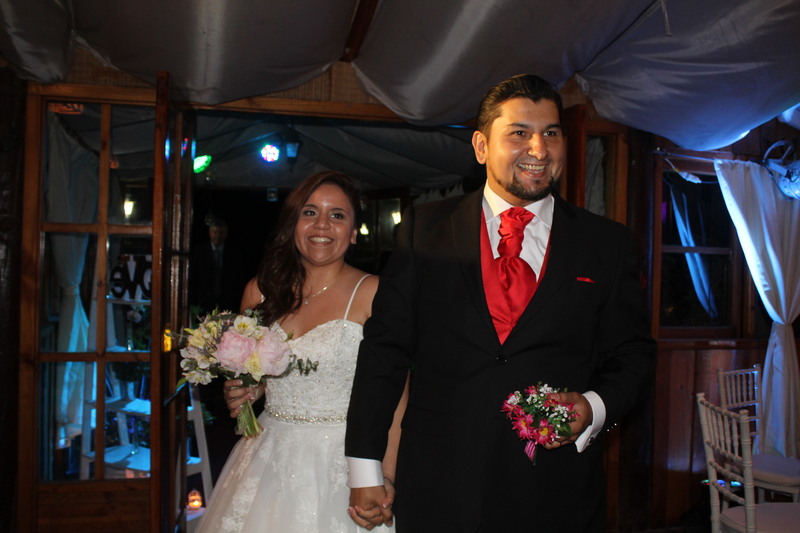 The wedding ceremony started at 9 p.m. We arrived at the reception venue just prior to 11 p.m., and the party lasted until 5 a.m. Lucia made it until about 3 a.m. I had just experienced the most intense pain of my life, a back spasm that was literally crippling. That pain led to what I later learned was a “Vasovagal response” – essentially, the trauma was so intense that it triggered a slowing of my heart rate and a drop in my blood pressure – and in fact I lost consciousness for a few moments. It was frightening. It happened on Wednesday, November 23. 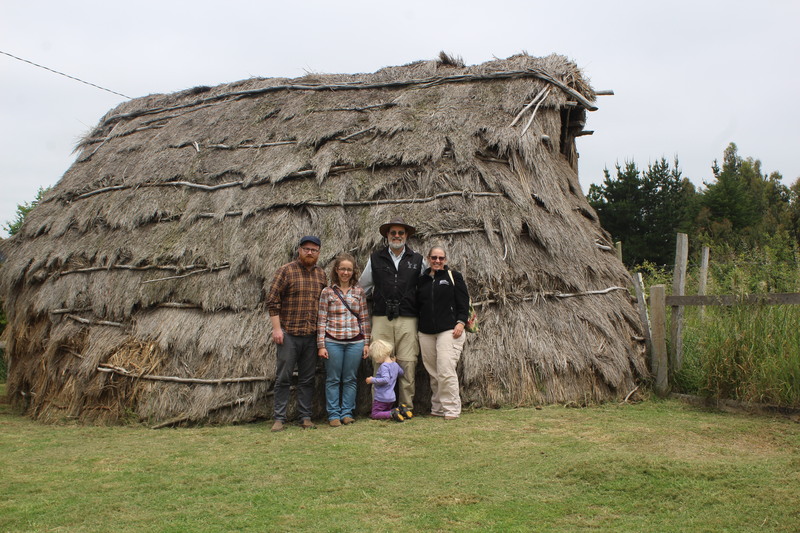 Several hours previously, Sharon, Ariel, Drew, and Lucia and I had arrived at La Communidad Llaguepulli in the Araucania region of Chile, where we were intent on learning more about these indigenous people and their culture. The Mapuche are the “first people” of Chile, and were here to greet (or suffer under) the conquistadores of Spain several hundred years ago. 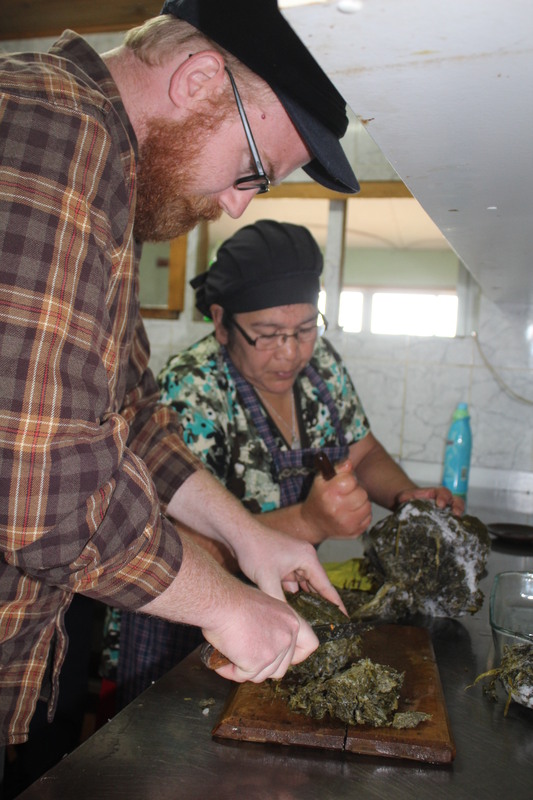 As an ethnic group, Mapuche comprise nearly 10% of the Chilean population, yet we have heard many of the older members tell of the ways in which the Mapuche were deprived of opportunities to practice their culture and in fact suffered from attempts to “educate the Mapuche” out of them. 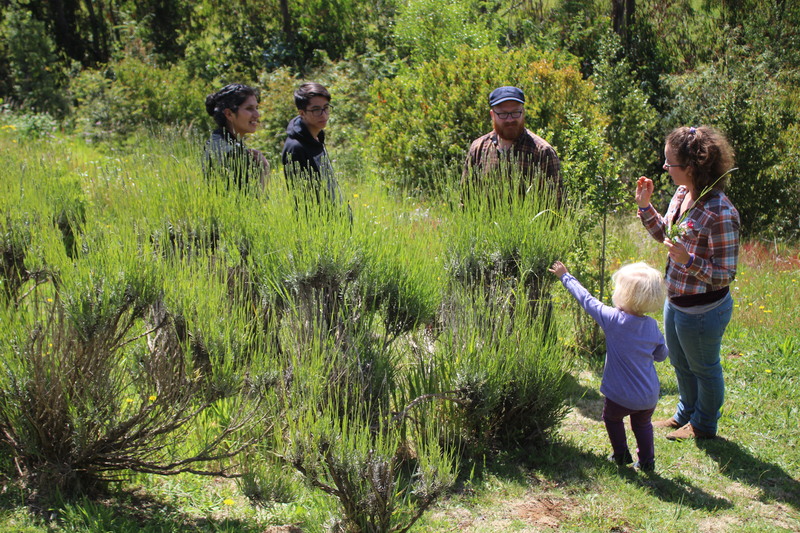 Our hope was to spend two days in this remote place, bearing witness to the heritage of the Mapuche and learning more about their culture and world-view. And when I suffered my spasm, I was afraid that this hope would be crushed. However, this is what happened: a young woman who is studying to be a doctor immediately took my blood pressure and other vitals; she gave me fluids and made me comfortable. Another woman offered me some tea made from the bark of the Palo Santo tree, a traditional remedy for inflammation. And the entire community made accommodation for my limited mobility for the next twenty four hours. As a result, our family was able to spend Thanksgiving with a beautiful community and learn a great deal about how they view life, the universe, and everything. We made sopaipilla (fried bread), soup, and other delicacies; we tried our hand at weaving and spinning yarn (the really productive kind, not what I usually do when I spin a yarn…); we heard about the theology and cosmology of these people; and we even took a boat ride wherein Lucia and I tried our hand at fishing. And I should mention that we were the first people ever to stay in a newly-constructed cabin within that community, which is trying to expand their hospitality to eco-tourists in the hope of bridging cultural gaps and promoting awareness. It was ironic that all of this happened on Thanksgiving, because it’s not the first time that some visitor named Carver has had his skin saved by the kindness of Native Americans. If I can believe what the older folks have told me, my great-great-great-great-great-great-great-great-great-great-great uncle John Carver was in a similar fix. 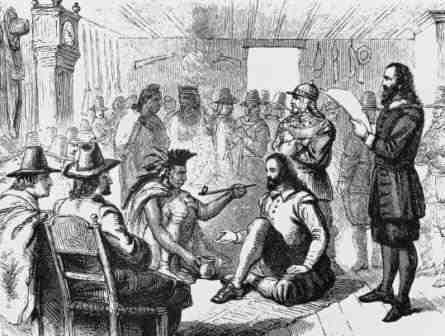 Sketch depicting John Carver and Yellow Feather Oasmeequin [a.k.a Massasoit] smoking a peace pipe commemorating the treaty. In 1620, old Uncle John had been elected by his fellow travelers on the Mayflower to be the first governor of what they’d decided to call Plymouth Colony. 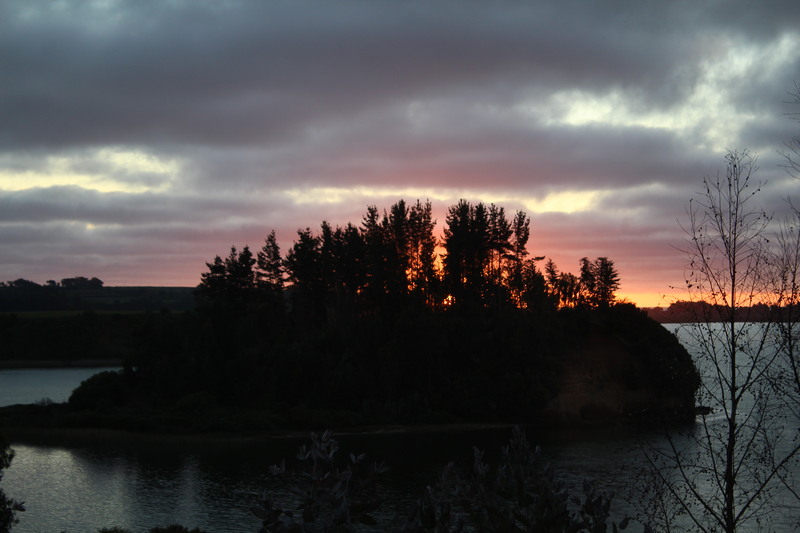 Interestingly enough, there were already people living on that spot – the Wampanoag people. The so-called “Pilgrims” were in a tough spot – the land, the weather, the animals, the inhabitants, and even many of the trees were new and frightening. The food ran short, and folks were dying. The Wampanoag were gracious, and pretty much everyone agrees that none of the passengers from the Mayflower stood a chance of survival apart from the help they received from the First People. Many of us in the USA remember this as “the first Thanksgiving” in 1621. While I’m pretty sure it didn’t happen the way that we read about it in the picture books, the long and the short of it is that when things got tough, folks chose to work together, to learn from each other, and celebrate – even while keeping an eye on one another. If you know much about “the rest of the story”, you’ll know that the first Americans didn’t fare so well with the folks who followed Uncle John. The European immigrants to the “new world” were unwilling to adapt to prevailing culture and languages of the people who were already there, and scores of people groups were simply wiped out. 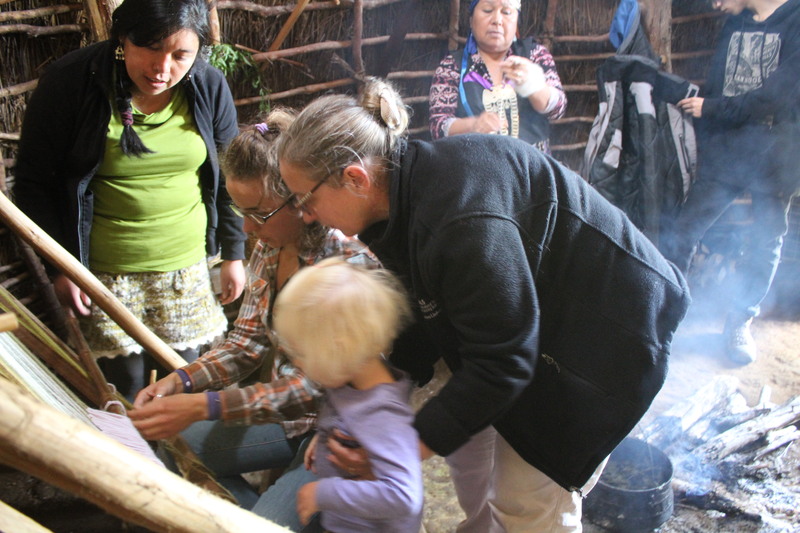 Which is why I counted it a privilege to be taking my grand-daughter – the 15th generation of Carvers to be found in the Americas – to visit a community of indigenous people on Thanksgiving. Make sure you get what I’m saying: we didn’t travel all this way to somehow atone for the ways in which conflict has soured relationships between various ethnic groups; and we didn’t come to place anyone on a pedestal nor to abase our own culture. We came to simply celebrate the fact that there are MANY cultures, many voices in the choir, many ways to look at life. What we take for granted may or may not be “what everybody knows”. And that’s OK.
My hope is that in making a visit like this, we are modeling for our communities (both here in Chile as well as at home) the truth that “The earth is the Lord’s and the fullness thereof, the world and ALL that dwell therein.” I want to honor those who are different; I want to learn about that of which I am ignorant; I want to be a better neighbor to the folks on Cumberland Street as well as the Mapuche who breathe the same air and need the same water. It was a miserable, painful day. And yet one which occasioned thankfulness. I hope to pass it on in the days to come. 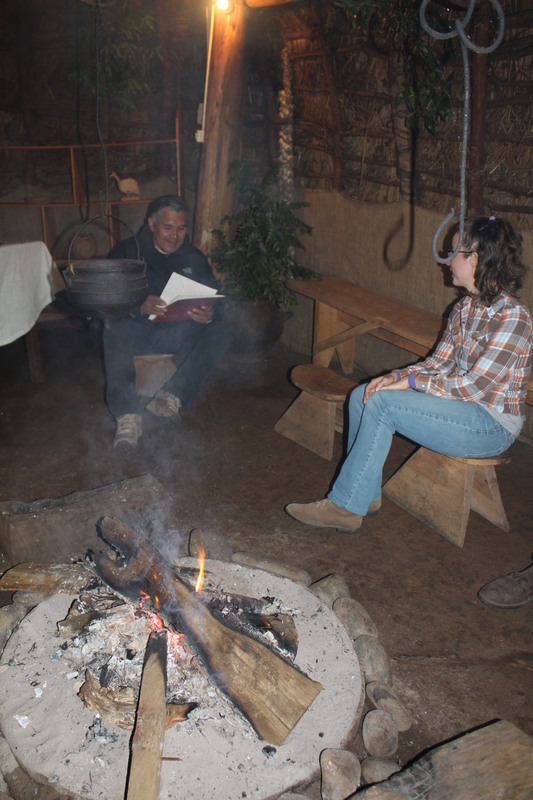 Outside a “Ruka”, the traditional home and gathering place of the Mapuche. Three generations of crafty women to bless my life! Drew helping with the stew. 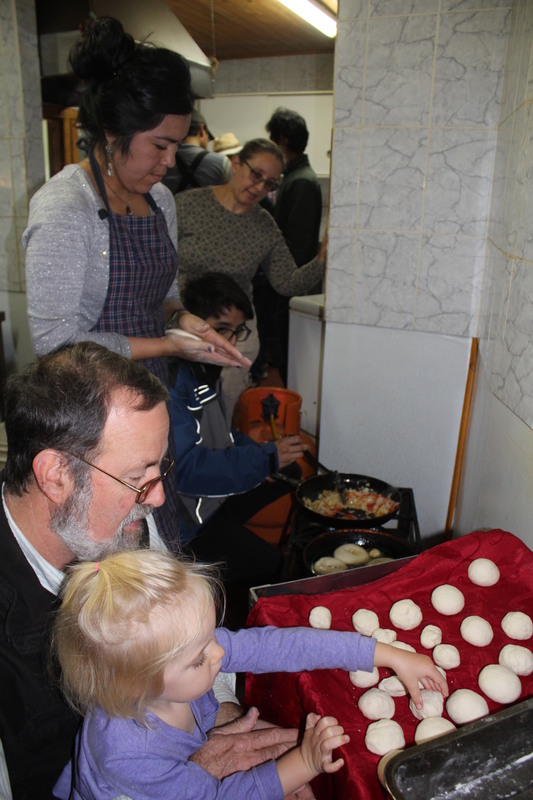 Making Sopapailla – the young woman instructing us is the medical student who attended to me. We had a ride in an ox-drawn cart! 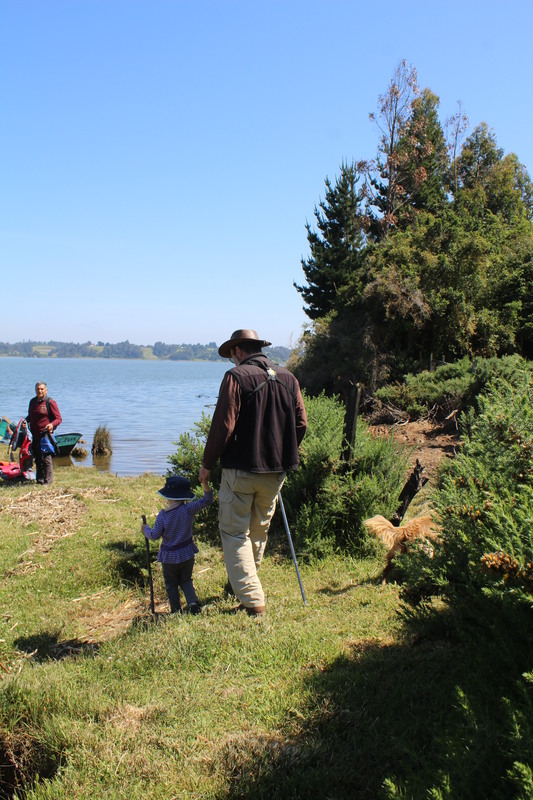 A walk down to the lake, which is surrounded by 120 Mapuche communities (about 13,000 people). 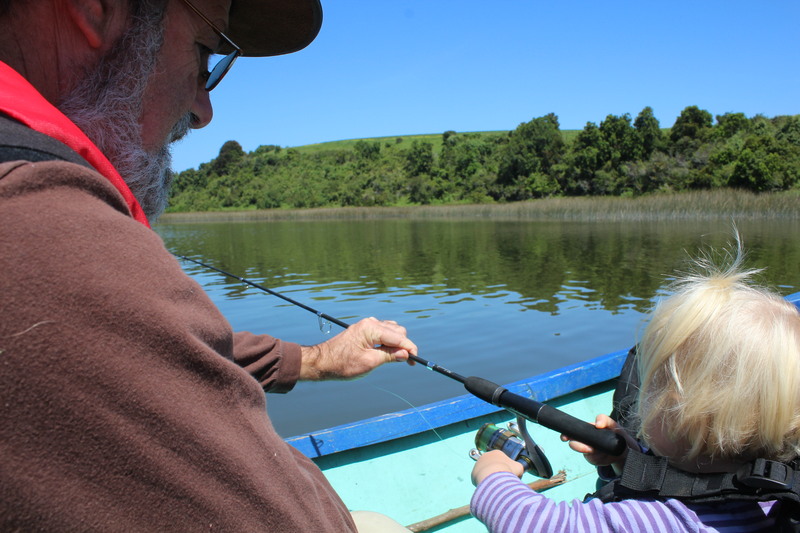 They weren’t biting, but we gave it a go! 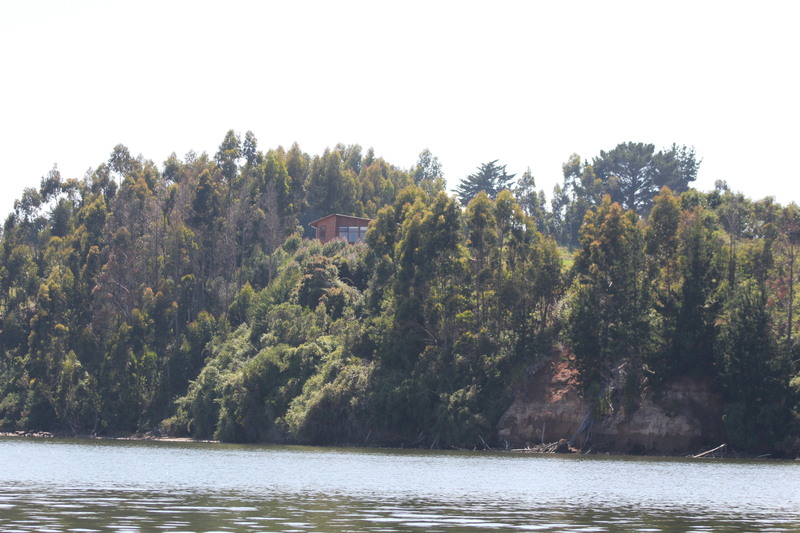 The cabin where we were privileged to stay the night overlooks the lake. 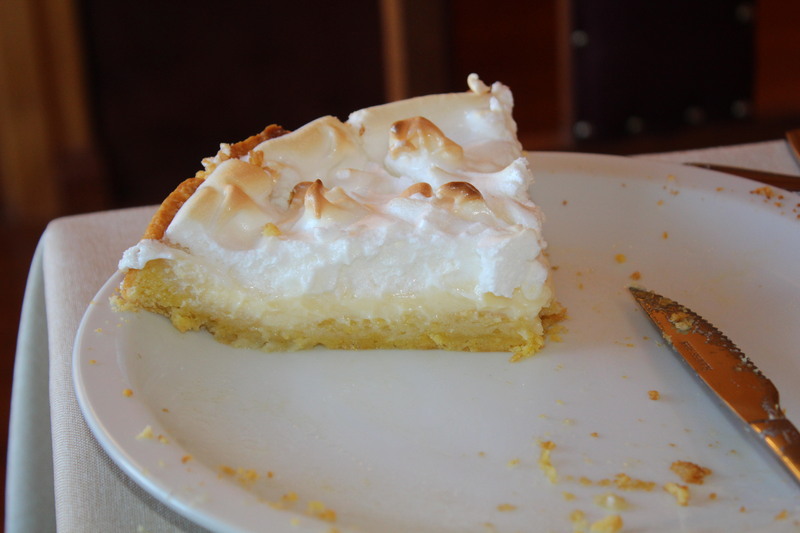 I’m not sure how traditional it is, but we were served a lemon meringue pie for breakfast on Thanksgiving! I think Uncle John would approve. A beautiful experience…a day filled with Thanksgiving! Which Story Will You Choose? For much of 2016-2017 the people of Crafton Heights will be exploring the narratives around David as found in the books of Samuel and Chronicles. It is our hope and expectation that we will learn something about leadership, power, humility, grace, forgiveness, and service as we do so. On November 13, 2016 we considered the place of gratitude and thanksgiving as appropriate responses to a climate of fear. Our texts included I Samuel 23:1-12 (contained within the text of this message) as well as I Samuel 22:6-23 as well as II Corinthians 9:6-11. In case you missed it, there was an election in the United States earlier this week. It was in all of the papers and some of the television networks even mentioned it. I don’t know if you were glued to the returns or lost on Netflix on Tuesday evening, but I was fascinated by one thing. There were rows of desks full of people who were talking about what was happening, and then someone like George Stephanopoulos or Lester Holt would turn to a colleague and say, “Tell us about what’s happening in Wautaga County, North Carolina, Bill…”, or “Let’s take a quick look at Macomb County, Michigan.” And the analyst would throw a map of this obscure (to me, at any rate) county on the board and we’d be bombarded with information about how many left-handed, college-educated, men in that area played lawn tennis and changed their own oil. Well, maybe not exactly, but we’d hear demographics about these counties and we were told that these were “bellwether communities”. That is, these regions were supposed to be able to help the entire nation contextualize a larger question, or help us see how this particular group of “real Americans” address one of the issues of our day. The whole map seemed too daunting, but a glimpse into one of these towns helped us to process what was or wasn’t happening. This morning, we’ll leave the election behind but I will invite you to visit another bellwether community. Let’s take a look at the citadel of Keilah, a small fortress in the lowlands of Judah. This community was on the fringes of the nation of Israel, at the base of the mountains that led upward to Jerusalem. This is bad news. These are Israelites – children of God – who are being attacked by the Philistines, or “sea people”. This is a particularly vicious attack because they are targeting the threshing floors. That means the Philistines are not only bringing violence to the city, they are stealing the food that the community will need from now until the next harvest. This is already a problem, and if help doesn’t come soon, it’ll be a disaster. This is good news on several fronts, isn’t it? David, even while he is running for his life from an irrational King Saul, does what real kings ought to do. He seeks the Lord; he puts himself on the line in service of those who are weak or vulnerable; and he defeats the enemy. But that’s not to say that everything is honky-dory. Even though the Philistines are, at least for the moment, taken care of, Saul is still breathing murderous threats against David. Saul was told that David had gone to Keilah, and he said, “God has delivered him into my hands, for David has imprisoned himself by entering a town with gates and bars.” And Saul called up all his forces for battle, to go down to Keilah to besiege David and his men. 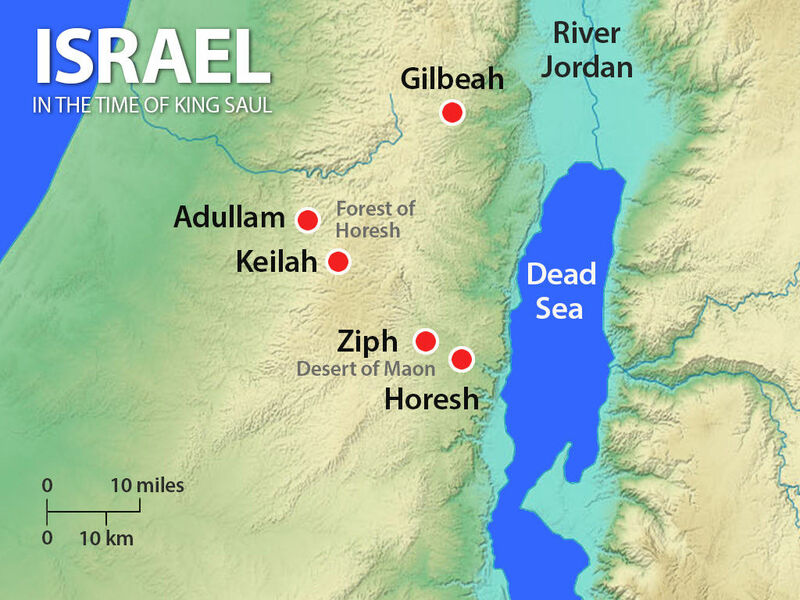 Even though David and his men had just come and saved their bacon (although I suppose that being Jewish, there wasn’t much actual bacon to be found), the Lord tells David that the inhabitants of Keilah will hand him over to Saul in a heartbeat. Doesn’t that just take the frosting right off your flakes? Let that sink in a bit… David is minding his own business, trying to protect himself and his men in the desert. The town council sends out the Bat-signal and, at great risk to themselves, David and the boys show up in the nick of time and rescue the children, save the women, and preserve the harvest. The town is saved – yay! And how does Keilah repay David? By throwing him under the bus…or the chariot…or the camel…or whatever. They’re preparing to turn him over to King Saul. Fortunately, David is warned of this plan by God, and he gets out of town as quickly as he can and goes to hide in the wilderness near the town of Ziph. He’s not even unpacked there when the Council of that town sends a message to Saul that David and his men are there, ripe for the picking. Seriously? Who does that? Obviously, people who are afraid. Saul, so far as anyone knows, is still the King. Saul runs the army. He’s the Commander in Chief. Saul could really hurt us – we don’t want to mess with Saul. I mean, don’t get me wrong – we really appreciate what David and the fellas did for us, but… let’s be real. We’ve got to think practically here. The inhabitants of Keilah and Ziph probably feel at least some level of discomfort about what they’re doing to David, but the reality is that their fear of Saul was stronger than their gratitude to David. They had the opportunity here to choose their own story and to write themselves in their own narrative. What if they had said, “Yo, Saul… don’t bother. David is our guy. David saved us”? We’ll never know, of course, because in this instance fear won the day. Fear and insecurity are powerful forces in our world. So let me ask you: Is Keilah a bellwether? Is that little community an accurate predictor of what is or should be? Do you think that fear is stronger than gratitude? And don’t tell me you don’t know anything about this kind of fear. This has been a long week for everyone in the USA. Some of us were paralyzed prior to Tuesday night, and others afterwards. Change is on the horizon, and it appears to be a significant change. You can feel the anxiety in the air in lots of places. Tension is everywhere. Families are arguing, friendships are being challenged, allegiances are being tested, and everywhere we go, uncertainty seems to raise its head. And in the midst of that, you got a letter from the church saying that it’s time for us to think about our giving for 2017. How in the world are we supposed to think clearly about that right now? The markets are all volatile and economies are unsteady. Is now the time we want to talk about money in the church? Well, now is the time I’d like to talk with you about what kind of people you would like to be; or, to put it another way: now is the time for you to decide who you’re going to be – which story you will choose to write as you enter the next chapter of your life. Keilah and Ziph had a choice: will we live into our fears, or will we respond to the anxiety in our lives with gratitude and hope? As we turn the page toward Advent and Christmas and even 2017, which story will you choose? Will we allow fear and uncertainty to reign in us, or will we act like people who trust in the Lord of all creation, the maker of all that is, seen and unseen? Things were pretty rocky when Paul wrote to his friends in Corinth and challenged them to be people of generosity in a time of famine. When the region around them was faced with uncertainty and lack of resources, he reminded them that kindness and encouragement and generosity are the things for which we are created. He invited them to live into a narrative that brought out those things in their character. I don’t know what happened to Keilah – the Bible doesn’t really say anything else about after David saved it and they thanked him by throwing him out. But David turned out all right, didn’t he? I know that the Corinthians heeded Paul’s advice and the church of Jesus Christ went from being a loose affiliation of a couple of dozen scattered faith communities to being the visible expression of Christ around the world. What’s going to happen in our homes? In our neighborhood and world in the year to come? I don’t know the answer to any of that. I sure can’t control most of it. 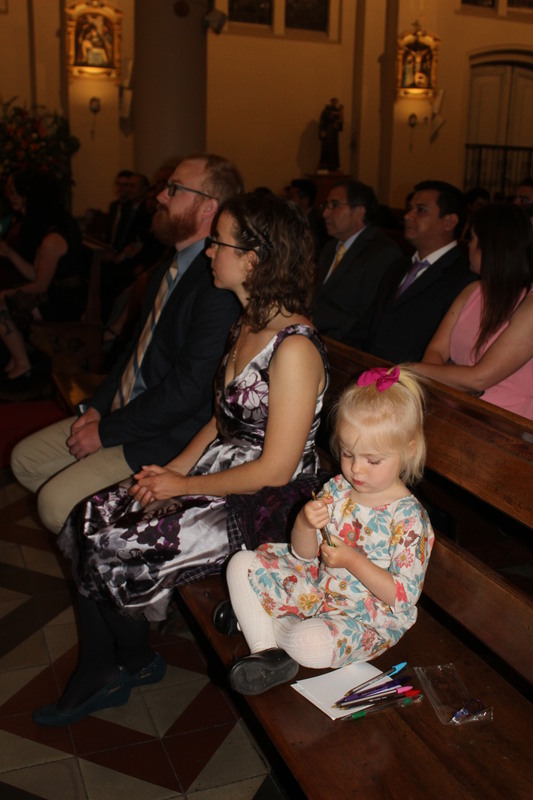 But this is what I do know: on Tuesday evening I’ll be getting on a plane and flying to South America, where I’ll be preaching at the wedding of a young woman who was here for a year and changed for a lifetime because people in this community invested in her. 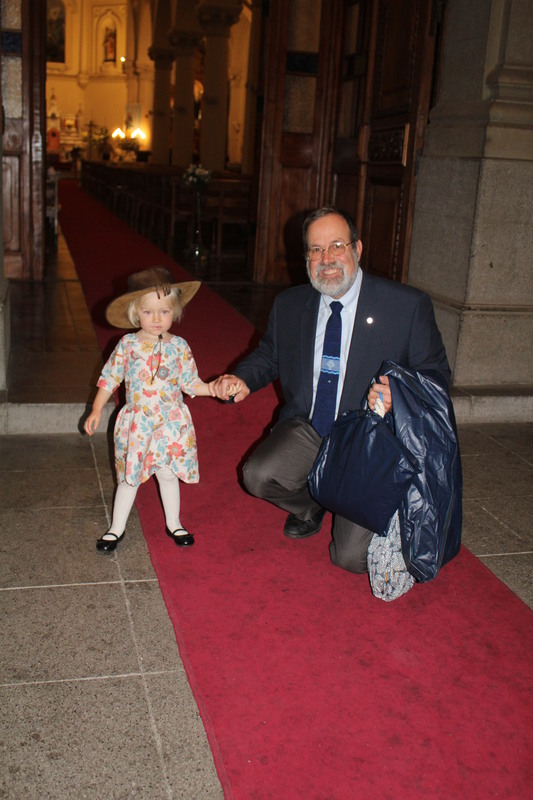 While I’m in South America, I’ll be taking my granddaughter to visit a community of indigenous people in Chile so that she can learn something about appreciating a culture that is really different than the one in which she’s being raised. On Christmas, I’ll be taking a group of amazing and courageous young adults to one of the hardest, most difficult places on the planet because they want to go there. They have sensed God’s call on their lives to grow in service and hope and love. And sometime in between these trips, Sharon and I will fill out our “estimate of giving” card. I’m telling you now that in this time of uncertainty and fear, I’ll be doing my level best to write a larger number in there than I did last year. In the year to come, I hope to learn how to be more generous with my time and resources and love. I want to give blood. To love my neighbors – the ones who are like me and the ones who are unlike me; the ones with whom I agree and the ones with whom I disagree. To look for birds. To pray for my country. To work to protect the environment. To treasure life – every life – all life. I trust that I will not be alone. Thanks be to God, we are never alone. Amen. For much of 2016-2017 the people of Crafton Heights will be exploring the narratives around David as found in the books of Samuel and Chronicles. It is our hope and expectation that we will learn something about leadership, power, humility, grace, forgiveness, and service as we do so. On November 6, 2016 we encountered the horrific day when Israel’s King slaughtered Israel’s priests, and we wondered how in the world we got to that place. Our texts included I Samuel 22:6-23 as well as Colossians 1:15-20. On December 31, 1988, Buddy Ryan’s Philadelphia Eagles traveled to Soldier Field in Chicago to take on Mike Ditka’s Bears in a divisional playoff game. The first half was sunny and clear, but then the fog rolled in from Lake Michigan and visibility was reduced to a matter of feet. Bears linebacker Mike Singletary said, “When I think about the last plague when Moses told the people the Death Angel was going to come in, it was like that.” Terry Bradshaw, who was in the booth for CBS that day, said it was the most frustrating game of which he had ever been a part. 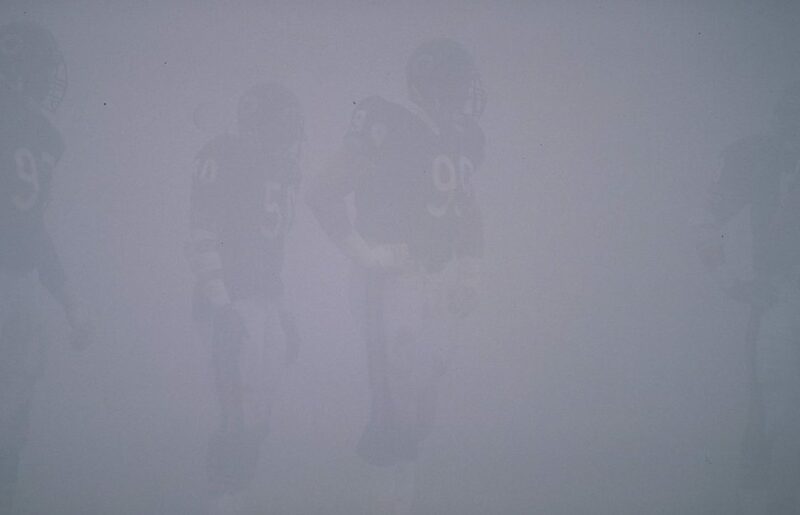 The crowd could not see the game and in fact the players could not even see across the field. Referee Jim Tunney ended up announcing the down and distance for each play on his wireless microphone. Some of the Eagles argued that the game should have been suspended because of the difficulty seeing the ball, but the NFL had no rules about fog-related play, and the so-called “Fog Bowl” was played to completion even though most of the people participating in it were severely limited in their ability to play the game. Saul Commands Doeg to Slay the Priests, James Tissot (1836-1902). This is clearly the case in ancient Israel. For several months now, we’ve been walking through the stories that relate to David, the shepherd boy who slew Goliath and grew up to become the greatest king that Israel ever knew. We’ve walked with David through both triumphant and difficult situations, and you’ve just heard the horrific account of the day that King Saul slaughtered 85 priests in the town of Nob because one of them had helped David and his men. 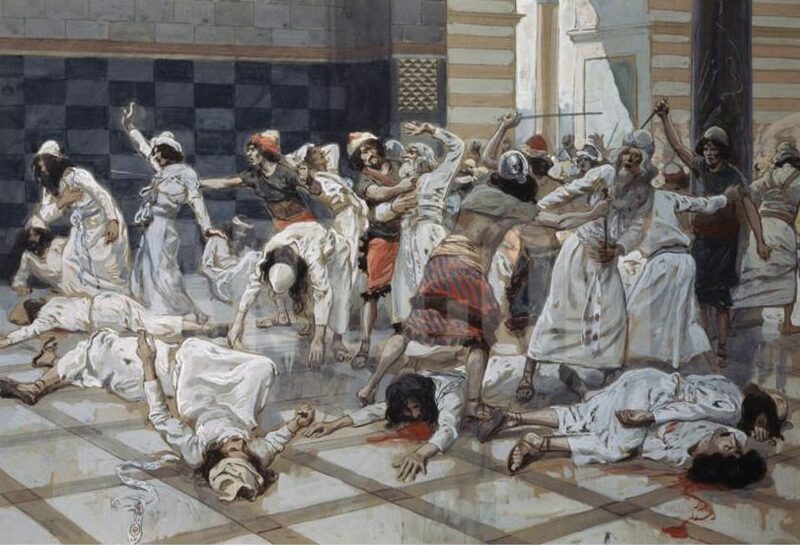 In fact, Saul was so irate that after he finished with the priests, he ordered the extermination of every inhabitant of the entire town – men, women, and children – as well as all of the animals. Saul, and all of Israel, really, was lost in a fog that day. He could not see what mattered; he did not appreciate what was true… It was simply horrible. How did we get to this place? And, to be honest, it’s not all bad at first, but by and by Saul begins to believe his own press releases. He falls in love with the trappings of that office and the seemingly limitless power that kings have. Saul and Samuel are increasingly irritated with each other. Everything comes to a head the day that the Lord sent Saul out to fight the Amalekites. These were people who had opposed the Israelites as they left Egypt and had generally made life miserable for God’s people, so God commanded Saul to take his army and cleanse the land of anything Amalekite-related. Saul sets out to do that, but when he gets rid of most of the enemy soldiers, he discovers that they’ve got some really, really nice stuff… and it seemed like such a waste to get rid of all of it… and Saul felt really big and strong when he was parading the Amalekite king around… Saul became lost in the fog of his own power and acquisitiveness that day. And for years, Saul continues acting as Israel’s king. He lives in the palace, he signs all the paychecks… but every day, he’s looking, wondering, who will it be? Meanwhile, David is secretly anointed as king and in an odd twist, is called by Saul to be a servant in the royal household. Saul knows that something is coming, but not when, not who, not where… It is a recipe for madness, for paranoia, for distrust. Eventually, he sees the success that David is having and assumes that David is out to get him, and so he acts preemptively by seeking to kill David. He gets so wrapped up in his hatred for David that, as we have heard, he issues a direct order to murder the priest that helped David. And to murder all the other priests. And to murder every man, woman, and child in that village. And to kill all the animals and destroy the entire community. The person who was unwilling to carry out a death sentence on the enemies of God now, in a fit of rage, exterminates the people who are actually serving God. Everyone… everyone except… except Abiathar. A young man from the priestly family somehow escapes and runs to David for protection. On one level, it’s an account of how one frightened young man saves another in a time of horror and conflict. However, on a deeper level, this becomes the narrative for a fundamental shift in the fabric of the nation of Israel. 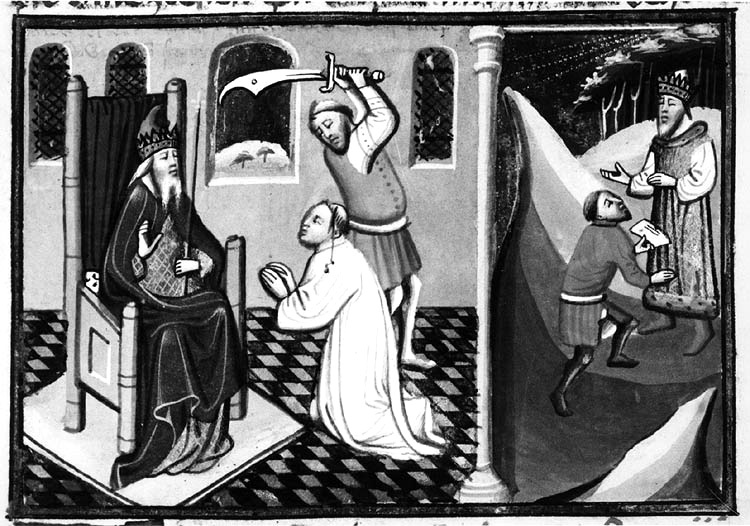 Never again would the priests help Saul to “inquire of the Lord”. Saul is completely and utterly on his own from here on out, as the power of the priesthood and the priestly endorsement passes to young David… or, to be even more accurate, the priests, in the person of Abiathar, have finally caught up to what God has been doing for years. These are horrible stories. And they are especially horrible on Preschool Sunday. Come on, Carver, were you even thinking? 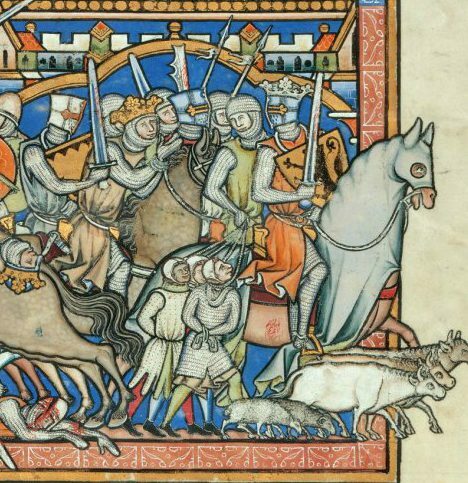 These people aren’t here to listen to the slaughter of the inhabitants of Nob; they hoped to see their children have a good time with their school friends at church. What can we possibly learn from this? We learn that God does not leave his promises vacant. In our narrative for today, if Saul had somehow managed to destroy the priesthood or silence God, then faith would be dead. Yet what we have is a description of the way that a remnant is preserved. Abiathar survives to serve the Lord even on this unholiest of days. We learn that God does not need Saul in order to do God’s business. In the days to come, we’ll be reminded that God doesn’t need David, either. We learn that God chooses to use those who are seeking the best and who are willing to make themselves available to God. Now don’t get me wrong – I have some pretty strong ideas about who I’d like to see on the “ins” and who I’d prefer to be on the “outs”. I have some deep fears about what might happen if the candidate I prefer should lose on Tuesday. But that’s just me, walking through the fog, talking two days before a close election. The truth that resounds through the ages is plain and simple: God does not need Trump or Clinton or Stein or Johnson in order to be God. God is God today, and God will be God a week from today. On Wednesday, in all probability, we’ll wake up and discover that someone has been elected to serve as the 45th President of these United States. And, in all probability, there will be fear. There may be lawsuits. There will be planning and plotting and anger and sadness. There will be winners and losers. And in the midst of all that, at 7:15 on Wednesday morning Treva will come and open the Clairhaven Street doors (unless someone leaves them unlocked on Tuesday night – we’ve really got to step up our “locking the door” game, people) and we’ll get ready for another day here. Mrs. Mack and the rest of the Preschool team will arrive and set up the classrooms. Families will come and drop off their children – you should see that street between 9:20 and 9:40 – a sea of vehicles, each bearing an assortment of car seats and bumper stickers and dings and dents… Children will come in and learn about squirrels and turkeys, and their teachers will talk with them about what it means to be thankful. Jason, Brad, and another group of folks will make sure that the after school program is ready to roll. Students will come in and do their homework, be challenged and stimulated by experiments and activities, and engaged by supportive relationships as we do our best to equip them to be and do their best. The Deacons will continue to plan and prepare for a new food ministry that will take shape next month. An amazing team of young adults will take the next steps in laying the groundwork for their life-changing trip to Malawi, Africa. The work of the church will continue in every single way come Wednesday morning. And outside the church? You’ll go over to Shop N Save to get milk, we’ll say hello to friends who are in hospitals, and a few of you will decide it’s finally time to put up the storm windows at home. In short, we will continue to live as though God, not any human being, is in control. The election will have occurred, and it will have consequences, but the fabric of reality will remain unchanged. Our task, come Wednesday, will be difficult. No matter which side prevails in the election, the people of God will continue to have before us the work of reconciliation. Did you hear what Maddy read about Jesus earlier? “He is before all things, and in him all things hold together.” That was true when Abiathar was hightailing it out of Nob; it was true when the fine citizens of Colossae were doing their level best to ride Paul out of town on a rail, and it’s true today. And it’ll be true on Wednesday. I’m telling you right now that it is not just a good idea, it is God’s command for you to be working on this ministry of reconciliation with your neighbors – even the ones who support the candidate you can’t abide, or who give voice to opinions you find detestable, or who hold values different than you do. You who wear the name of Christ are not free to dismiss anyone; you do not have the option of name-calling or bullying. Instead, we are called to live out Christ’s intention of justice and peace for all and in all and over all and through all. Some of you have some nerve-wracking and anxiety-filled days ahead of you. But I’m here to tell you that the fog will clear, and the sun will rise. In fact, he already has. Thanks be to God, the Son has already risen, and that is the only thing that can drive away the fog. Amen.